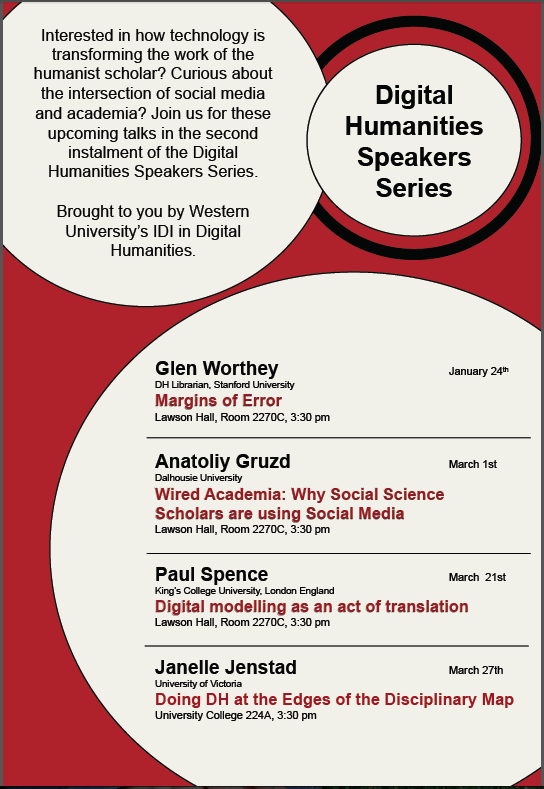 The second instalment of Western’s Digital Humanities Speaker Series is starting on Thursday, January 24th with a talk by Glen Worthey, the Digital Humanities Librarian at Stanford University. Last term’s talks were a great success, with the audience and the interest growing with each speaker. As the IDI in Digital Humanities at Western launches its first two classes, please join us in welcoming this semester’s speakers in raising awareness of the importance of technology in humanities education and research. There are a number of ways to get involved in the Digital Humanities at Western this year: you could attend one of the talks in the DH speaker series, you could visit Cultureplex to learn more about the tools they are developing, or you could bring your own topic and meet up with us for a chat at unLab on Wednesday, October 24th. That’s right, we’re taking DH off campus for one night a month, and we’d like you to join us for our first meeting. In keeping with the DH tradition of having open-minded get-togethers, we’re going to leave the agenda up to the attendees, THATCamp style. 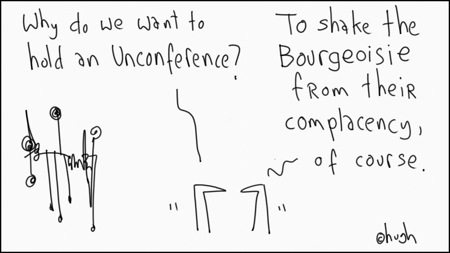 It won’t be an unconference as such (though we can still shake the bourgeoisie up a bit), but just an evening of getting into each others’ heads. All we ask is that you bring an idea that you’d like to talk about, whether its a question about DH in general, thoughts about getting a project going, problems you are having with research, or something you would like to build/create/play with. The idea is just to meet each other in a less formal atmosphere, explore our interests in DH, and let contemplation and collaboration ensue. The unLab is London’s hackerspace, and is located here. The space has been provided for us from 7 pm onwards, and has plenty of fun things to explore. If you have further questions, either reply to this post or email me at kmart5@uwo.ca. See you soon! On Friday October 5th I was part of a sold out event hosted by the Ontario Augmented Reality Network (OARN) held in Toronto. Academics, business professionals, and media were all present to hear keynote speakers Bruce Sterling (@bruces), Gene Becker (@genebecker), and Helen Papagiannis (@ARstories) contemplate the past, present, and future state of Augmented Reality. 3. They have criteria that the tool must uphold; namely that it strengthens their community values. Although Rob made it clear that the Amish may have different criteria for evaluating a tool than the rest of society might, it was simply having criteria at all that was thought-provoking. One group member asked “Where’s the WordPress?” – making note of the fact that AR for the most part is found on handheld devices whose software is controlled and controlling. It would take open-source AR tools, many agreed, for anything mindful to make it to the general public. What came out of this discussion on Amish Augmented Reality revolved around a question that some of the keynote speakers had found it difficult to address earlier in the day: “What were the negative consequences of AR?” Instead of jumping on the technology bandwagon, strapping on glasses, and looking into another reality, many in our group sessions wanted people to close their eyes and be transported to another time or place by using their other senses. Instead of busting ghosts atop the CN Tower, we talked about creating new musical experiences to take people away from the everyday. We spoke about using AR for positive purposes, not simply for gaming or storytelling, but to be mindful in our applications of AR, to use them to create a sense of community and aid to those who might have trouble communicating elsewhere. 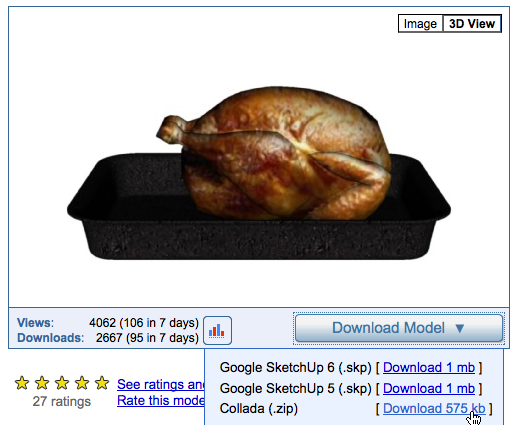 Perhaps most fitting for today, we contemplated the possibility of being able to sit down with your family for a meal (mmm… turkey!) when you are miles from home.